Publisher's Note: Products purchased from 3rd Party sellers are not guaranteed by the Publisher for quality, authenticity, or access to any online entitlements included with the product. For more than 40 years, this well-regarded reference has bridged the gap between basic and clinical sciences for the many disorders associated with electrolyte imbalances and kidney dysfunction. 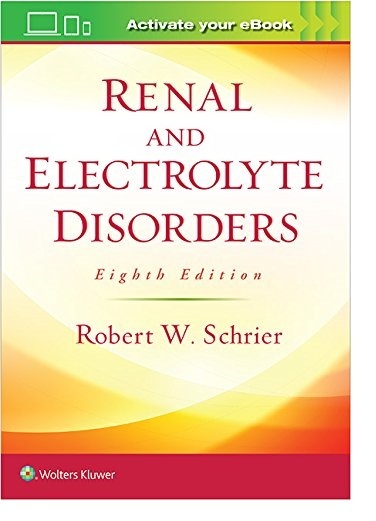 Authoritative and easy to read, the eighth edition has been thoroughly updated by experts in the field to reflect recent developments in renal pathophysiology. Each chapter first introduces normal physiology, then covers each disorder’s clinical features, diagnosis, and treatment. Helpful diagrams, algorithms, and tables further explain the complex concepts. Key Features:A new two-color format throughout promotes easier comprehension and faster navigation.Redrawn and colorized line drawings make complex concepts easier to understand and more visually appealing.New coverage includes: recent developments in disorders of water homeostasis; substantial new information on genetic hypokalemic and hyperkalemic disorders; new content on calcium, phosphorus, vitamin D, and parathyroid hormone activity; a new chapter on the genomic and nongenomic effects of angiotensin and aldosterone in renal and cardiovascular disease; an up-to-date discussion of the pivotal role of the kidney in the pathogenesis of hypertensive states; new advances in our understanding of the glomerulopathies and vasculitides; and much more.Ideal for all members of the nephrology team, including residents and fellows in nephrology, internal medicine, and other specialties, as well as nurses and physician assistants.Your book purchase includes a complimentary download of the enhanced eBook for iOS, Android, PC & Mac. Take advantage of these practical features that will improve your eBook experience: The ability to download the eBook on multiple devices at one time — providing a seamless reading experience online or offlinePowerful search tools and smart navigation cross-links allow you to search within this book, or across your entire library of VitalSource eBooksMultiple viewing options offer the ability to scale images and text to any size without losing page clarity as well as responsive designThe ability to highlight text and add notes with one click.